to snap a photo. It was very, very tasty. 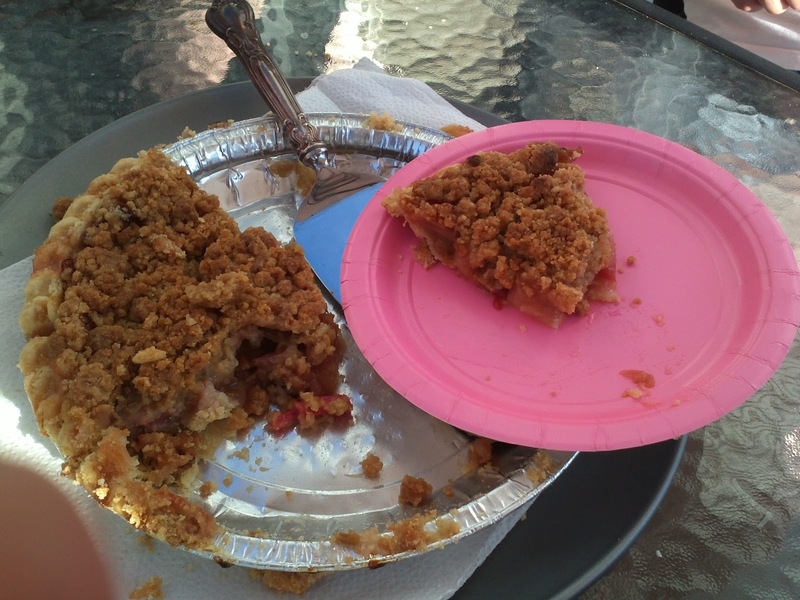 Rhubarb season has started in late May, and Meredith got her hands on some. She was quite excited. What she didn't know was that there wasn't enough rhubarb for the pie she wanted to make, so she winged in and threw in an apple as well. Very creative (and super tasty, of course!). The one warning Meredith offered is for the prepared pie crusts in those shallow tin pans. They're not as big as they say they are, and there's a big risk of everything bubbling over. The next time she makes this, she's going to buy the flat pie crust and put it in her ceramic pie plate - it's much deeper and will do a better job at containing the mess. The recipe is loosely based on one of Martha Stewart's rhubarb pie recipes, however, Meredith substituted a few ingredients, did her own thing with the pie crust and left out the plastic kittens thermal glued to the jail cell bars. Press the pie crust into a deep, 9-inch pie plate, trimming edges if necessary. Refrigerate for 1 hour. Prepare the crumble topping: in a medium bowl, mix flour, brown sugar, sugar, and salt. Using a spoon (or your hands) MIX in the butter until clumps of mixture form. cover and refrigerate until ready to use. Move oven rack to the lowest level and preheat to 400-degrees. In a large bowl, toss rhubarb, sugar, cornstarch, and salt. Transfer mixture into pie shell and sprinkle with crumble topping. Place pie on a foil-lined baking sheet to catch any overflow. Reduce oven temperature to 375-degrees and bake for 90 minutes, until topping and crust has browned lightly. If the pie starts to brown too quickly, cover pie in a tin foil tent. Apple doesn't have enough taste, next time add either raspberries (frozen works great), strawberries or cherries. Meredith doesn't make her own crust? I'm shocked! I've never had rhubarb.. The recipe looks interesting.